White peppercorns and tamarind together form an excellent palate profile for this dish which seems unique to the repertoire of Straits Chinese cooking. The peppercorns are first lightly toasted in a dry shallow saucepan before grinding to help accentuate its flavours. Having said that, using good quality peppercorns make a difference as well. 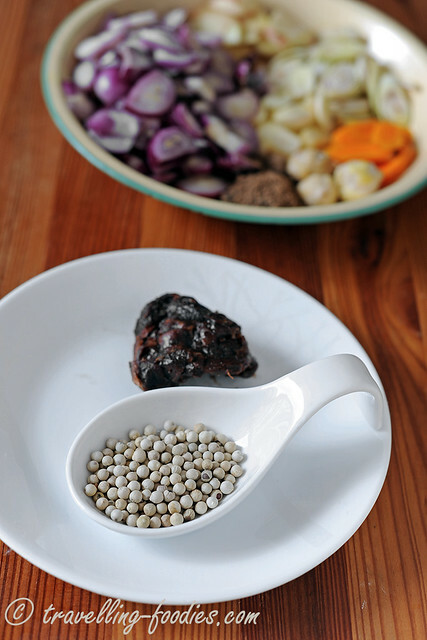 The Sarawakian white peppercorns I’d used in this dish was gifted to me by Nyonya Gwen Ong. 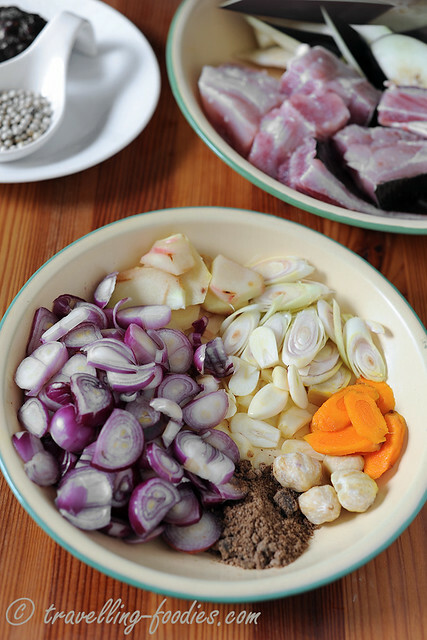 Standard rempah ingredients for many dishes in Peranakan cuisine, which is used here for the “kuah lada“. 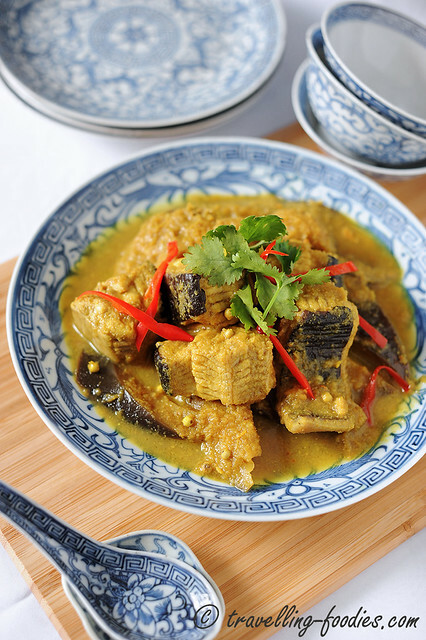 This melange of ingredients also forms the backbone for many other Peranakan dishes such as the rempah in “gerang asam” and even for “ayam masak buah keluak“! It is through intricate nuances in some of the key ingredients used that sets one signature dish apart from the other! Pound or grind all rempah ingredients into a paste. Cut eggplant into finger-length slices, and soak in a bowl of water added with 1/2 tsp salt. This helps to prevent the eggplant from browning. Add cooking oil to a heated wok, followed by rempah paste. Add tamarind juice and bring the concoction to a boil. More water may be added at this time. 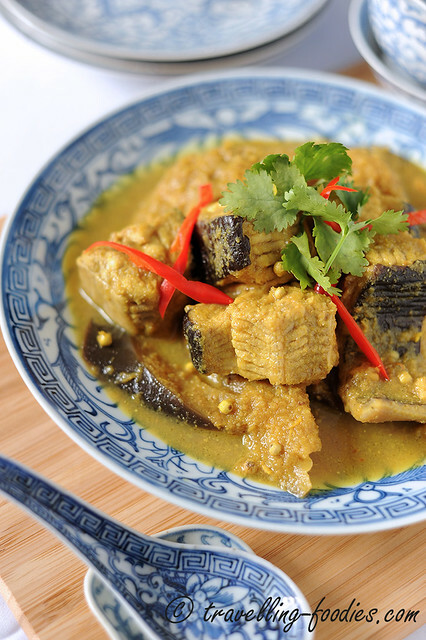 Add sliced eggplant and stingray chunks and stir slightly to combine with the kuah lada sauce. Leave to simmer under medium-low heat until the fish is just cooked. Eggplant would have soften considerably as well. Season with salt and a small amount of sugar to balance the flavours. Serve with rice, together with other dishes. NOTE: other meaty fish varieties like threadfin (ikan kurau) are also good for this dish. just that they are traditionally cooked with stingray for the much coveted sweetness in the meat. Another variation to the kuah lada is to add 1-2 red chilies to the rempah which would render the sauce spicier and a redder appeal. This seems to be popular amongst the Peranakans in Melaka. This entry was posted on May 23, 2014 by Alan (travellingfoodies). It was filed under Food, Simple Eats and was tagged with asam, bawang, bawang puteh, belacan, galangal, garlic, iakn pari, kunyit hidop, ladah puteh, lengkuas, merah, peppercorn, rempah, shallots, stingray, tamarind, tumeric, white pepper.